I’ll admit that while I’m a rabid skating fan, I’m always a bit leery of skating fiction. I’ll devour a good autobiography of a skater, a how-to manual, or a book covering the history of some facet of the sport. But fan fiction has never held much of an allure for me. Perhaps because skating itself, or witnessing first-hand the interactions at the rink, provide enough drama that I don’t need to relive it on the page. So when I got the book Flying Camels and Tiger Mothers I decided to put my bias aside, and I’m glad I did. Author Andy Schell is a skater himself, and clearly has witnessed enough of the behind the scenes drama to give an accurate yet fanciful portrayal of the dynamics of skating mothers and their daughters. One expects that since Schell knows the sport that the skating part of the story will be accurate, but I was also impressed with the structure of the rest of the story. The basic story revolves around two young girls name Tonya and Mei, both Senior level ladies competing for a berth on the Olympic team. Both have stage mothers who are constantly in the wings driving their daughters to be at the top of every podium they encounter. 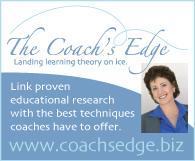 Tonya has a triple axel, just like her namesake Tonya Harding, as well the artistry to go with it. Mei has superior artistry as well as an arsenal of jumps. Of course, they become a well-matched set of rivals as they train for all the qualifying competitions, through Nationals as they make their way to berths on the Olympic team. While the girls just want to skate and develop friendships (including with each other) outside of the rigors of daily training, their mothers have other ideas. They scheme, plan, and occasionally commit small crimes in order to get their daughters to the top of the podium. 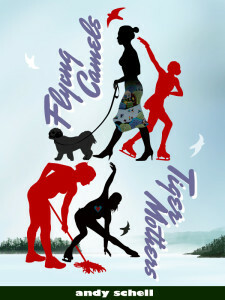 There are misunderstandings along the way, and some well-crafted drama not only between the two families, but also between the girls and their parents as they develop not only their skills as skaters but as strong-willed young adults fighting against the claustrophobia of being elite athletes. It all culminates with the National Championships, where a surprising collaboration finally allows the two skaters to claim ownership of their skating and their dreams. While the tale relies on a few basic and typical skating stereotypes — the skating family with money competing against the family without, and ever-present stage mothers — there is some terrific character development and atypical plot twists and tensions throughout that do keep the reader on their toes. Even this reader gasped more than a few times while reading. I also laughed out loud quite a bit, since Schell has a nice gift for humor and makes some astute, sometimes snarky, analogies that will leave any skating fan giggling. My one (minor) complaint would be that the story wraps up a bit too abruptly at the end, although it makes me wonder if there is a sequel in the works. There certainly could be. 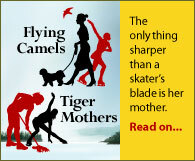 Flying Camels and Tiger Mothers made me wonder if I’ve been too hasty in my judgement of skating fiction. I think all skating fans would enjoy this book, and I may have to start reading some of the other skating fiction out there on the shelves.